On Location Experiences, the official hospitality partner of the National Football League and Bud Light, the official beer sponsor of the NFL, have announced the launch of the first-ever Bud Light Super Bowl Music Fest. 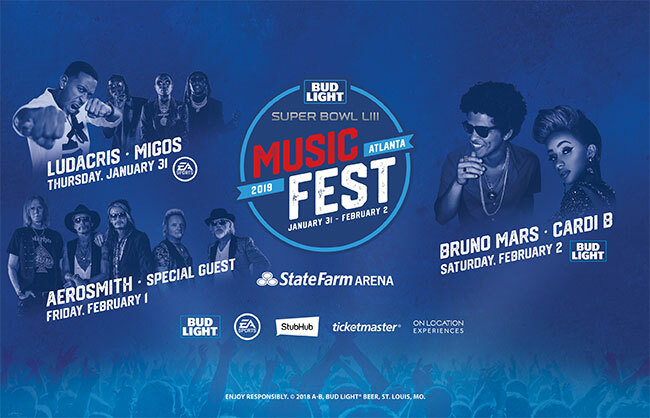 The three-night festival will give football fans and the entire city of Atlanta an opportunity to enjoy the artists they love from Thursday, January 31st through Saturday, February 2nd at Atlanta’s fully transformed, premium, sports and live entertainment venue State Farm Arena. On Saturday Night, the Bud Light Super Bowl Eve concert will feature one of the world’s biggest pop artists Bruno Mars and one of the top female rappers in the game Cardi B. Friday’s lineup includes Rock and Roll Hall of Famers Aerosmith and soon-to-be-announced special guest. Electronic Arts Inc.’s EA Sports Bowl will once again serve as the unofficial kickoff to the biggest weekend in the NFL season Thursday night (Jan 31st) with a Welcome to Atlanta Showcase that features Atlanta hip-hop legend Ludacris and friends, as well as a special Quality Control Music showcase featuring rap supergroup Migos, Lil Yachty, Lil Baby and more. In addition to top-level talent spanning a multitude of genres, the festival will feature celebrity and athlete appearances. Additional presenting partners for the Bud Light Super Bowl Music Fest are StubHub and Ticketmaster. An array of premium seating offerings, including suites and club packages, will be available also featuring options for premium hospitality.